When I took an end-of-the-season inventory of my native specimen garden, it was a trip down memory lane, as most of the plant materials I have installed there were inspired by little road trips to my favorite public gardens for strategic look-sees at who is planting what, when and where. Walking through Morton Arboretum's Schulenberg Prairie got me growing everything from oxeye sunflowers and joe pye weed to stiff golden rod, and compass plants in my front and backyard wildlife gardens. I was first introduced to the winsome sway of grey-bearded cone flowers and swamp milkweed as we strolled the Nature Boardwalk of Lincoln Park Zoo, and get this: A host of my Illinois wild flowers selections trace back to the countless trips I have made to the educational Butterfly Garden at Brookfield Zoo. But, probably my biggest what-to-plant-now-and-next influencer has been the four season landscaping of Millennium Park's Lurie Garden. That is where I became bedazzled by bluestar in the Spring, passionate over purple prairie clover one Summer, pleased with pale coneflower that Fall, plus bound to beautiful browns every Winter. 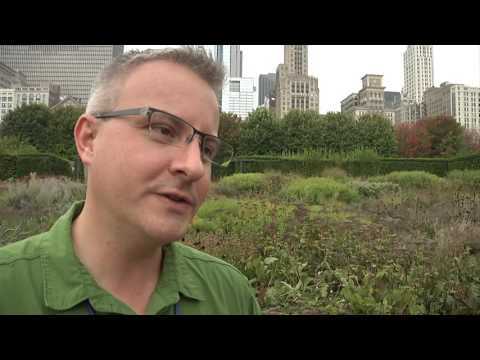 In late September when Lurie Garden's Director Scott Stewart (the former manager of the Oak Park Conservatory and a current resident of Oak Park) agreed to take me on a behind-the-scenes tour of what most people do not see as they stroll the walkways, we did not hesitate to dig right in to get all the dirt behind what makes this gorgeous garden go ...including finding out where Head Horticulturist Laura Ekasetya helps tend to Lurie's bees. What? Who knew they kept hives here, too? Well, belated spoiler alert: Now you do.